Investing in 2019 means looking for growth at a late stage of the economic cycle. 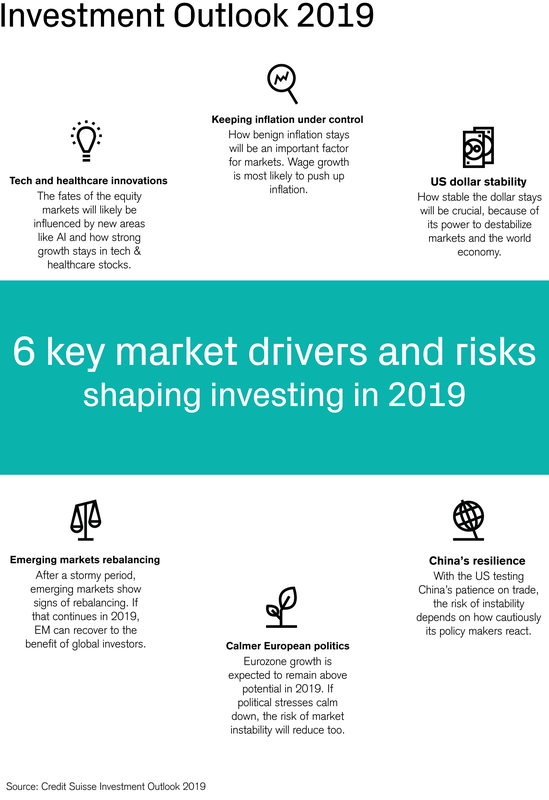 Our Investment Outlook 2019 identifies six key market drivers and risks that will be particularly important for investors next year. The past year has been significantly tougher for investors than expected. A combination of economic and political disruptions boosted market volatility. In early 2018, fears of rising US inflation led to an upward shift in interest rate expectations which boosted the US dollar but put pressure on emerging markets in nations that depend on US dollar liquidity. Trade tensions also escalated. Later in the year, worries over flagging growth in China and the Eurozone further increased risk aversion. Finally, earnings expectations declined in key sectors, a setback to the leading technology sector. Going into 2019, we believe there are good reasons to believe that risk assets will once again find their footing. In our latest Investment Outlook, we argue that there are at least six key factors that should provide support. Inflation should remain moderate, reducing the risk of major interest rate shocks while also suggesting the US dollar and other currencies should be more stable than in 2018. Supported by limited policy easing, China's growth should prove resilient in the face of trade tensions while the more fragile EM correct their imbalances. Finally, we also expect political tensions in Europe to subside while technology and health care innovations continue to drive long-term growth and equities. Watch our Global Chief Investment Officer, Michael Strobaek, explain the outlook for 2019 in brief.